Tarazod Films & Media LLC: Free screening after the Chicken Coop Tour! The Madison backyard chicken coop tour is this Saturday! After the tour, come to a free screening of the film. The MadCity Chicken Coop Tour is a great event for both the curious and the serious to learn more about backyard chickens. This is a self-guided tour of coops throughout Madison. Location information for this year's tour is coming soon. 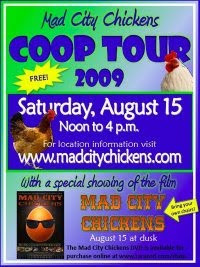 You can also see a map of the tour with addresses and descriptions of the host coops and flocks at www.madcitychickens.com. Special this year: See Mad City Chickens the movie! End your coop-touring day by enjoying a free screening of Mad City Chickens as it was meant to be seen - in a backyard with chickens! Movie starts at dusk. The filmmakers will be there to talk about their movie and answer questions from the audience. The movie will be shown at the home of Lucinda's Saloon - 1937 Vahlen Street in Madison. Doors open at 7:30; movie begins at dusk.